Lot Detail - Clipper Ship Card - Boston Light, Randolph M. Cooley, NYC. Clipper Ship Card - Boston Light, Randolph M. Cooley, NYC. Rare clipper ship card for the “Boston Light” with Commander Holway at the helm, advertsining 101 days to San Francisco, c. 1850s. 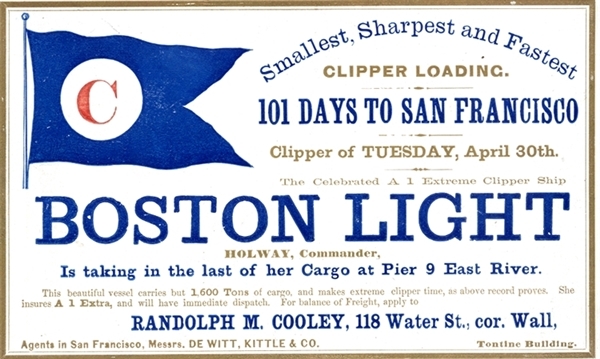 Sailing card for the "Smallest, Sharpest and Fastest Clipper Loading," operated by Randolph M. Cooley, with a pennant bearing a large C. Holway was the commander. 6-1/2”x4”. Fine condition.